Le prix et la disponibilité du produit sont corrects en date du 2019-04-22 18:31:25 BST et sont sujets à changements. Toute informaiton relative au prix ou à la disponibilité affichés pour http://www.amazon.fr/ au moment de la commande sera d'application lors de l'achat de ce produit. Z-Tactical Push-to-Talk Button (MOTOROLA) SINGLE PIN The attachment clamp on the back can be twisted 360 degrees Easy and flexibl to use in all situations For Motorola Handsets The Peltor military standard version PTT (push to talk) unit allows the connection of the Z-Tac headsets to your PMR radio. 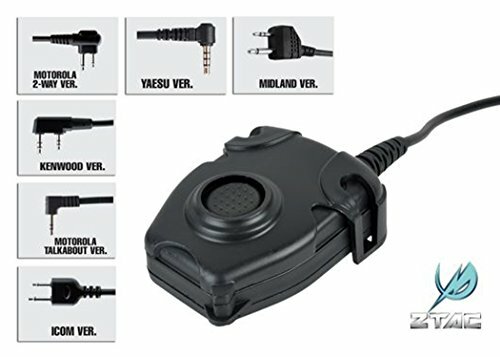 The PTT connects to your headset via the military style jack plug. A large button is depressed when you want to speak allowing operation even with thick gloves on. The base of the unit has a heavy duty clothing clip to attach the unit to your equipment. Z-Tactical Push-to-Talk Button (MOTOROLA) SINGLE PIN. The attachment clamp on the back can be twisted 360 degrees Easy and flexibl to use in all situations For Motorola Handsets The Peltor military standard version PTT (push to talk) unit allows the connection of the Z-Tac headsets to your PMR radio. The PTT connects to your headset via the military style jack plug. A large button is depressed when you want to speak allowing operation even with thick gloves on. The base of the unit has a heavy duty clothing clip to attach the unit to your equipment.